Hello! I hope everybody is enjoying their weekend. It's kind of cool and windy here in Upstate NY today-A good day for crafting! I made a card for the Can you Case it Color Challenge #119. The color combo for the challenge was Gold, White and Blue! Perfect for this Month's Club Scrap Creative License Kit! 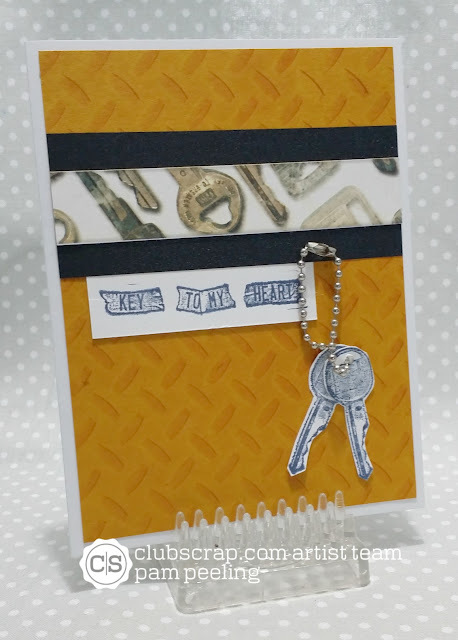 This kit has a great masculine feel with car themed papers and embellishments. I love the keys-so cute! It's hard to tell in the photo but the dark paper is actually blue and kind of sparkly! Be sure to check back to see what else I make with this amazing kit! Great card Pam! Love it! Great card,Pam. Can't wait for my box to arrive! Love the key stamp! Wonderfully masculine card! Love the theme Pam! Thanks for joining us at CYCI this week.